Upon clicking the Spread button on the Spread Transaction Popup, the transaction will be Spread and a new tab, Spread Details, will appear on the transaction record. At the moment of creation, only two line items will appear on the Spread Details tab, Spread Reversal and Spread Memorized. The Spread Memorized JE behaves identically to other Memorized Transactions in Restaurant365. Spread Memorized JEs are linked to the Spread Transaction that created them. Users can navigate to the Spread Transaction by clicking the 'Spread transaction' link in the JE header. The Spread Memorized JE will carry 'Spread for [Transaction Type] - [Transaction Number]' in the JE Comment field. 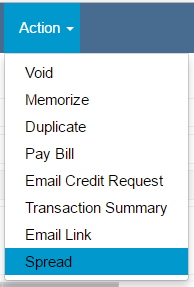 Additionally, after the first Spread Recurrence has occurred, the Transactions tab on Spread Memorized JE will appear. The Spread Transaction is now complete and no further activity will occur on the original transaction.